Hello Forevercashers and welcome to Session #7 of Passive Income 101! Today I wanted to talk about the importance of re-investing the cash flow created by your assets. The Wealth Wheel is my way of illustrating the principles that have guided me and that have benefited everyone who has put them into practice. I have considered some of the other tenants in previous posts, but today let's focus on the last one “Asset Produces Cash”. Forever Cash assets are those that produce cash month in and month out and which go up in value. While eventually you might consider retiring and living off of the cash produced by your assets, for the first few years that money should be put to work for you. Instead of just blowing that money on toys right away, why not reinvest the majority of it to buy a second, then a third, and then a fourth asset? Let’s say you have saved up enough money to make a good down payment on a house and to only have a $300 monthly mortgage. But you can charge $800 in rent. After having established your first stream of cash flow you might be tempted to sit back and relax. While I certainly think you should reward yourself from time to time, I think that money would be better used if you used it to purchase a second house. After two years of setting aside that rent money, you would have $12,000 in the bank. With a little extra saved from your job, side work, and cutting down expenses, you would probably have enough to buy a second house. Now you could have $1,000 coming in each month from those two houses. Instead of blowing that money on a new car or a big TV, why not save it up for another year or two, after which you can buy a third house? Now, after having been disciplined for four years or so, you will have created $1,500 a month in cash flow that will last FOREVER (and after the mortgages are paid off, that amount will go even higher!). 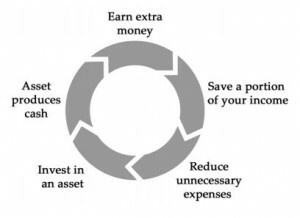 By reinvesting the money thrown off by your assets, you have leveraged it into ever greater income. Then, once you have reached $1,500 or more per month you will start to have real options. For example, will you retire or keep investing to have a luxurious retirement later on? Passive income is a beautiful thing, especially once you start making your income work for you over and over again.